about her role and ideas for patient/carer involvement in the future. Minutes from the meeting held on 28th August 2014 will be ratified at the business meeting in May. 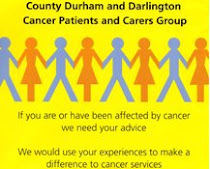 Overview of Macmillan; the role of a Development Manager; funding; and current work being undertaken to improve the lives of those affected by cancer in County Durham and Darlington. New Network website – http://www.nescn.nhs.uk? Next meeting is on Thursday 4th December in the Brown Room at the Pioneering Care Centre, Carer’s Way, Newton Aycliffe, Co. Durham DL5 4SF. The speaker is Andrea Williams (Macmillan Development Manager) who will give an overview of Macmillan, her role, and work being undertaken to improve the lives of those affected by cancer in County Durham & Darlington.